“We have just concluded the 21st APEC Economic Leaders’ Meeting which I chaired. I am pleased to say that our summit went successfully and was indeed very productive. In the course of two days, we discussed thoroughly the central theme of APEC 2013: Resilient Asia-Pacific, Engine of Global Growth. After our intensive deliberations, we agreed on a number of strategic points. Let me now highlight seven of them,” stated the Indonesian President, Susilo Bambang Yudhoyono, at the Bali Nusa Dua Convention Centre (BNDCC), on Tuesday (8/10). First, the APEC Leaders agreed to redouble efforts to attain the Bogor Goals by 2020. APEC Leaders shared a view that all economies must continue to gain from APEC. In line with this commitment, APEC Leaders have also agreed to take further steps to empower, attract and open opportunities for all stakeholders, to participate in APEC. Second, APEC Leaders agreed to increase intra-APEC trade, or intra-regional trade in Asia-Pacific, including trade facilitation, capacity building, and the functioning of multilateral trading system. The multilateral trading system is recognition that the promotion of intra-regional trade cooperation in Asia and the Pacific brings concrete benefits to APEC economies. “In this regard, we have agreed on a declaration which supports the multilateral trading system. We have also agreed to ensure the success of the upcoming 9th WTO Ministerial Conference in Bali, in December 2013,” President Yudhoyono explained. Third, APEC Leaders agreed to expedite people-to-people connectivity. In this regard, the strategic landscape for connectivity through the development of and investment in infrastructure. Connectivity may help reduce production and transportation cost, strengthen the regional supply chain, and improve the regional business climate. At the same time, infrastructure development and connectivity will create more jobs and ensure job security. Fourth, APEC Leaders reaffirmed their commitments to the attainment of strong, balanced, sustainable and inclusive global growth. To this end, APEC Leaders agreed to facilitate Small, Middle, and Micro Enterprises (SMMEs), youth, and female entrepreneurs. SMMEs are the backbone of the economy. Fifth, bearing in mind resource scarcity, APEC Leaders agreed to establish regional collaboration in order to improve food, energy and water security. This effort was aimed at addressing challenges to population growth and the adverse impacts of climate change. 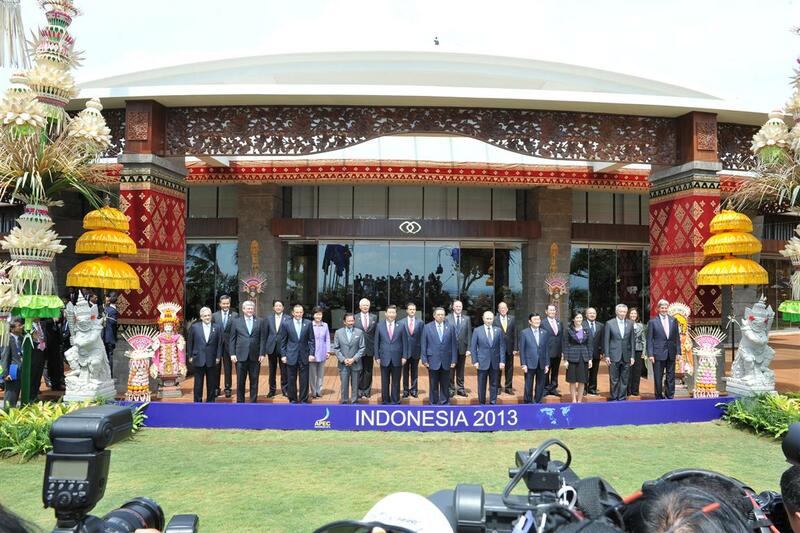 “At this Bali summit, we began to look at this matter in a holistic manner,” said President Yudhoyono. Sixth, APEC Leaders have agreed to ensure synergy in APEC and complement each others multilateral and regional processes, such as the East Asia Summit and G20. This is essential because the world is marked by multiple architectures of economic partnerships. Seventh, APEC Leaders agreed upon close cooperation with the business sector through ABAC to accomplish free and open trade and investment. Collaboration will result in a win-win situation, in particular at the time when the global economy has yet to fully recover. The People’s Republic of China (PRC) has officially accepted the chairmanship of the Asia-Pacific Economic Cooperation (APEC) 2014. Chinese Xi Jinping called for improved connectivity under the Asia-Pacific Economic Cooperation mechanism as part of efforts to promote economic integration and renewed his call to establish an Asian investment bank to finance infrastructure construction. Connectivity is vital to the Asia-Pacific region, which covers 21 economies and is home to a population of 2.8 billion, the president said. “China is keen to explore and develop investment and financing channels for infrastructure construction,” he add. Wei Jianguo, secretary-general of the China Center for International Economic Exchanges, a government think tank, said that promoting connectivity can help rebalance industrial structures and upgrade growth patterns among APEC economies. For developing economies in the region, a priority is to shift export-oriented economies into ones that depend more on “domestic power”, he explained. “It is crucial to improve coordination and information sharing among top-level government officials, as well as strengthen coordination on macroeconomic policies and jointly promote regional development,” he added. According to the International Monetary Fund, APEC members account for 54 percent of global GDP. Their economies, as a whole, are expected to grow 6.3 percent in 2013 and 6.6 percent in 2014. 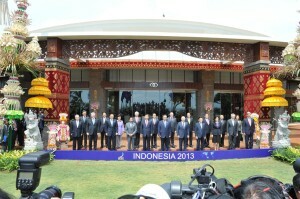 Nusa Dua, APEC 2013 – October 8, 2013.